NOTE: This story is re-published under the “fair use” provision of the U.S. Copyright Act. Please read the original story at the San Diego Union Tribune here, and cite the original source when hyperlinking. 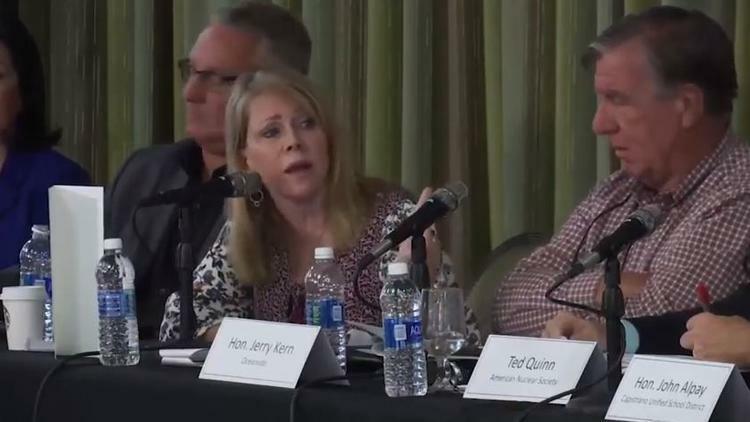 San Juan Capistrano city council member Pam Patterson has sometimes clashed with other members of the Community Engagement Panel, which gives the public updates on the decommissioning of the San Onofre Nuclear Generating Station (SONGS). But she won’t be asking any more sharp questions from the panel’s dais because last week she was ousted as her city’s representative to the panel by fellow members of the San Juan Capistrano city council. In a 3-2 vote, the council decided to remove Patterson from the SONGS panel. “I am definitely outspoken as far as the risk we all face in respect to health and safety as a result of the mismanagement that’s going at the San Onofre power plant,” said Patterson, who has often criticized the plant’s operator, Southern California Edison. Patterson will be replaced by San Juan Capistrano’s current mayor, Sergio Farias. The Community Engagement Panel was formed by Edison and has 18 membersrepresenting a range of stakeholders that include local governments, the Sierra Club, a labor union, a Native American group, a member of the American Nuclear Society and a representative of Camp Pendleton, where the SONGS facility is located. The panel is not a regulatory body and does not have rule-making authority. Members serve on a voluntary basis and do not get paid. The meetings typically involve a featured speaker, public comment and updates from SCE — usually centering on the 3.55 million pounds of nuclear waste stored at the site and efforts to move the spent fuel to another location. Patterson said she was not surprised by the vote because there had been earlier attempts by the city council to replace her. In San Juan Capistrano, the mayor’s position rotates among members of the city council in one-year increments. Farias assumed mayoral duties earlier this month. Although no longer a member of the Community Engagement Panel, Patterson said she will still attend the quarterly meetings as a member of the public. Patterson said she is a member of the board of Public Watchdogs, a San Diego-based activist group that been harshly critical of Edison and last month filed a lawsuit in U.S. District Court arguing SONGS should not be allowed to store nuclear waste since it no longer produces electricity. Farias said the Community Engagement Panel is “asking important questions” and said he will be an assertive member.